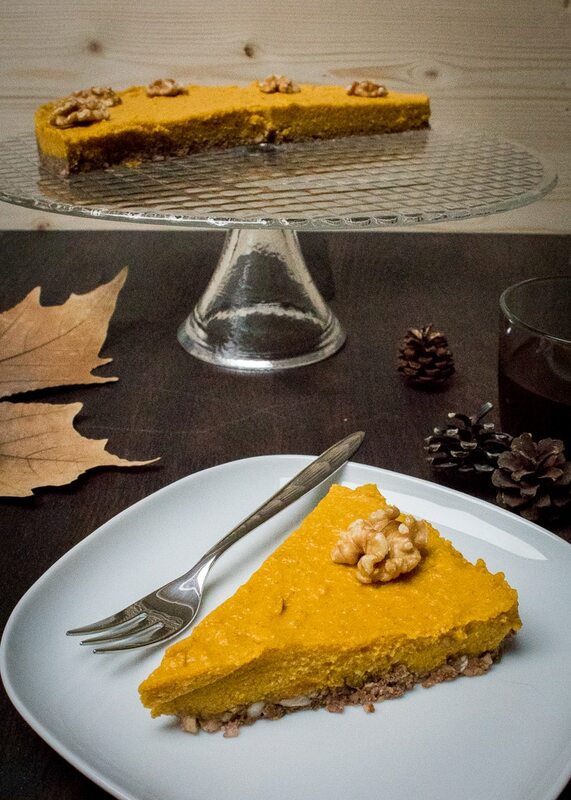 I’ve already made vegan cheesecake once but the one with pumpkin… Mmmm! Very aromatic and light, sugar free and heavenly tasty. I reduced the proportion in a little as we are only two people at home and it would be too much. If you wish to make this cake for a large group of people and want it to be highen than the one on the picture – just double the ingredients fro the cream. The cake tin has a diameter of 25cm. 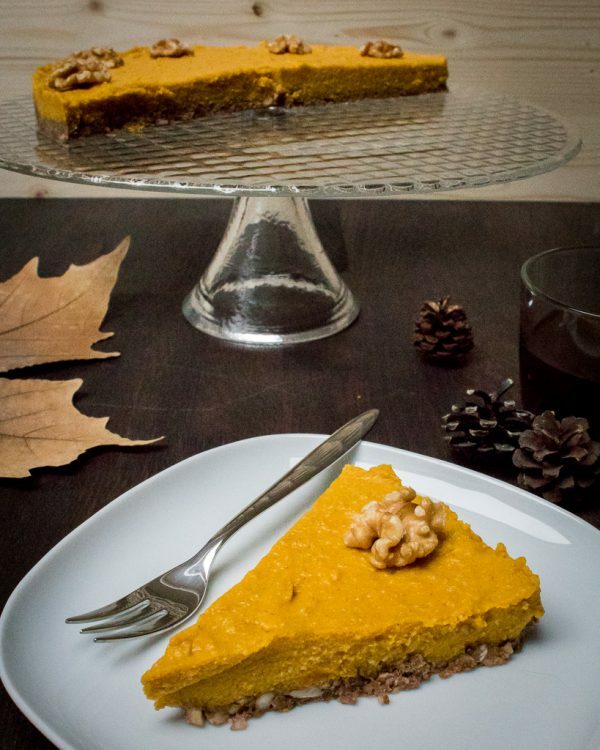 Vegan pumpkin cheesecake without baking – it’s aromatic, super fine and with nice taste. It’s sugar and gluten free but with unique taste. Soak the cashew nuts in water for 1 hour in advance. Soak the dates (without pits) in warm water for 10-20 minutes. Put the base layer ingredients in a blender and mix well. Spread in baking springform pan, smooth with a spoon or spatula. Press lightly so you can get even and flat. If the coconut butter is hard melt it in a water bath. If you will use agar agar dissolve 1-2g of in a little warm water, like the package says. Mix the cashew , the pumpkin puree (or pieces of pumpkin), the coconut butter and the spices in the kitchen blender until the smooth. If you wish to make this cake for a large group of people and want it to be highen than the one on the picture - just double the ingredients fro the cream. I am Milena. I am born in beautiful Bulgaria at the Black Sea coast and I love to travel the world. I am Milena. I am born in beautiful Bulgaria at the Black Sea coast and I love to travel the world. The taste and aroma of different cuisines inspires me to experiment when I cook. I want to share my experiences in cooking and traveling with you. You like what I am doing with Mamunche? There are some options how you can work with me.